Excerpt from the Art21 piece on Mark Bradford. Mark discusses his relationship with paper and its role in his work. 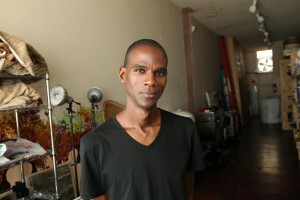 Mark Bradford was born in 1961 in Los Angeles, CA. He earned an BFA in 1995 and an MFA in 1997 from the California Institute of the Arts. His work characterizes the urban influence of his upbringing in collaged, abstract paintings that incorporate many unconventional materials. His works are usually large-scale painting type objects that use “found” materials. Mark Bradford has exhibited in the Sao Paulo Biennial (2006), Whitney Biennial (2006), Liverpool Biennial (2006), ARCO 2003 in Madrid, In Site at the Museum of Contemporary Art San Diego and the Centro Cultural de Tijuana, USA Today at the Royal Academy in London, Street Level (2007) at the Nasher Museum of Art at Duke University, at the Wexner Center for the Arts at The Ohio State University (2010), Sikkema Jenkins Gallery, the Institute of Contemporary Art, Boston (2011), the Museum of Contemporary Art, Chicago (2011), and the San Francisco Museum of Modern Art (2012). He currently resides in Leimert Park, Los Angeles, California. One of the great early William Wegman films, Two Dogs And A Ball. Starring Man Ray of course.